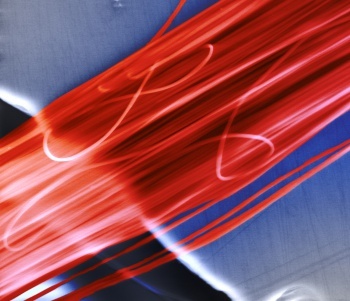 The new fibers could be used in anything from bridges to airplanes. A team of materials engineers at the University of Nebraska-Lincoln have developed a structural nanofiber that is strong and tough - a rare find. Most structural materials have to choose between strength or toughness - it's the difference between wood and rubber. There are very few materials acknowledged to be tough and strong, but by making the nanofiber thinner than any before, it become stronger - as expected. The surprise came when the fiber was also tougher than before. "Our discovery adds a new material class to the very select current family of materials with demonstrated simultaneously high strength and toughness," said Yuris Dzenis, the team's leader. Dzenis said he belived the nanofibers could have applications in many fields, from bicycles to bulletproof vests. "If structural materials were thougher, one could make products more lightweight and still be very safe," he said. The fiber is a polyacrilonitrile nanofiber, meaning it's a synthetic polymer related to acrylics. These nanofibers were made using a process called electrospinning, in which a high voltage is applied to the polymer solution until a continuous jet of liquid ejects - giving a length of nanofiber. The simultaneous toughness and strength of the material will allow lighter objects because, traditionally, engineers use more of a strong material to make up for its relative lack of toughness. Dzenis thinks that the new nanofibers' surprising toughness comes from their low crystallinity - because the material is less organized on the molecular level, it can therefore absorb more energy. The findings will be published in the April issue of the journal ACS Nano. Similarly, you used to have to sacrifice entertainment for information, but not so anymore! Our science show, Geekend Update, is released every Saturday.